Umenishiki Aromatic Ale by Umenishiki Yamakawa is a Belgian strong ale style beer from Ehime prefecture. Wait. Aren’t all ales from Belgian strong? I don’t know about you but all my experiences of Belgian beers have been those over 8% or perhaps that’s my view. I’m not a big fan of kriek style beers with lashings of cherries so I’m safe here. I think. The word “aromatic” conjured up weird ideas of people plotting what herbs and spices to put the beer. Well, if orange, nutmeg, and coriander work so well, what else could work? I mean, if this beer has won awards then some people do like it. Fancy beer in a fancy bottle for fancy people. Being poor, I didn’t have a suitable Trappist glass to use for Umenishiki Aromatic Ale so I used my safe glass. Until I remembered I did have a glass I could have used. In my defence it was a present in a Chimay beer gift set from an ex-student and I hid it from the kids. Anyway, Umenishiki Aromatic Ale poured out a cloudy bronze colour with a reasonable amount of frothy head. If it hadn’t been for the head, I would have sworn this was a barley wine from the looks of it. Aroma. Well if you’re going to label your beer as aromatic, it better well be. 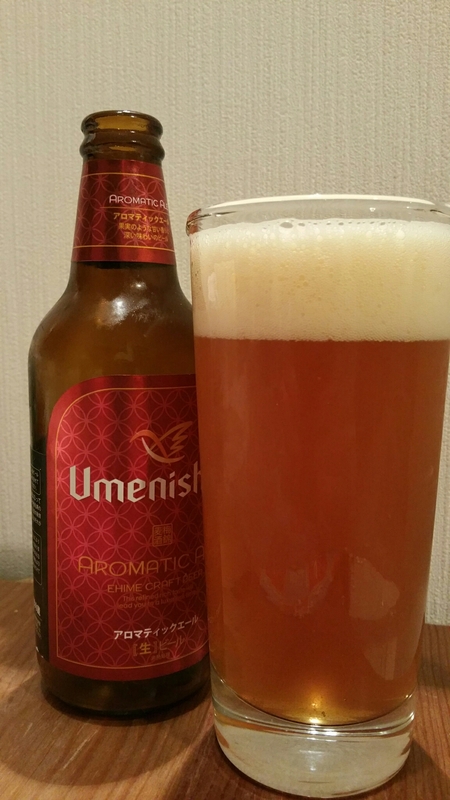 Umenishiki Aromatic Ale is but a bit on the funky sweet side. There was a hint of prunes which only came to me after a hideous tasting session in Costco. A fair amount of sweetness too that reminded me of caramel. When something reminds me of prunes, I’m a bit loathed to try it. Call it self-defence or evolutionary development but my brain was warning me. What could I expect? Marzipan. Again, my heightened olfactory senses are acutely aware of that almond paste rubbish that adorns Christmas cakes back in the UK. Which means Umenishiki Aromatic Ale is packed full of fruity tastes as well with the prunes making a comeback along with some caramel again and some cherries. Damn. Holding my dislike for cherries aside, Umenishiki Aromatic Ale is a flavoursome Belgian strong ale that should be tried. Once. Umenishiki Aromatic Ale can be bought at Queens’ Isetan around the country. Umenishiki have also listed shops across Japan where it can be bought here.